Every year, at a company that I worked at for 8 years, we had a Thanksgiving luncheon. Everyone signed up to bring different things. Since there were so many of us, five to six people signed up for the stuffing, different veggies, the pie, and so on. We even had many turkeys! My former boss, BJ, always cooked his turkey in the slow cooker. He said his mom cooked it that way when he was growing up. The turkey always turned out moist. I emailed him the other day because this year, we decided to cook our Thanksgiving dinner early- we enjoyed it on Sunday night and I wanted to try my hand at cooking the turkey in the slow cooker. He told me you can leave it in longer than the 6 to 8 hours but it starts to fall apart, which is totally fine! 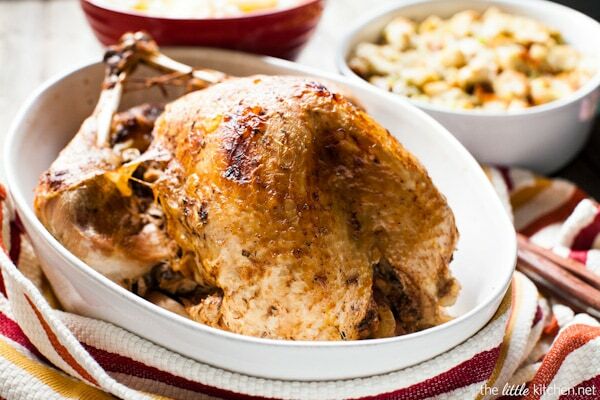 Just make sure the turkey you buy will fit in your slow cooker! If you’re running low on oven space or just want a low maintenance way to cook a turkey- the slow cooker is the way to go! 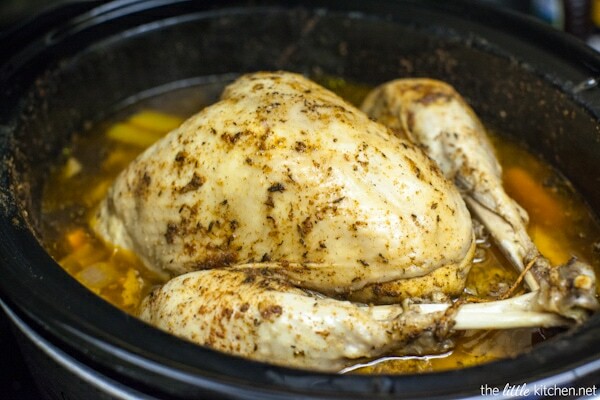 This turkey version is a modified version of my popular whole chicken in a slow cooker recipe that we LOVE to make all the time! 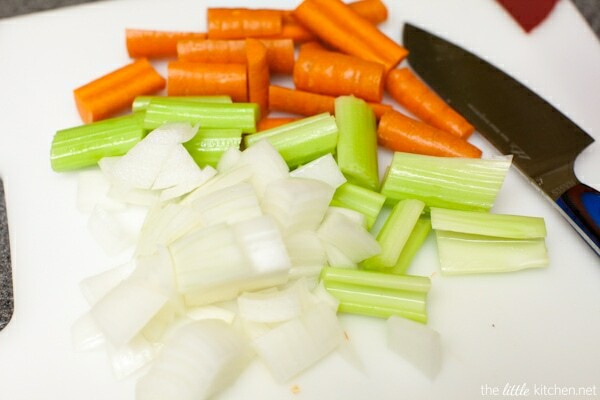 Cut up the vegetables and add them to the crockpot. Fold back the wings and rub the turkey with garlic. Add the rub to the inside of the turkey and all over it. All ready to go into the slow cooker. I put one of the garlic cloves and the rest of the dry ingredients I didn’t use on top of the veggies. Place the turkey on top of the vegetables and cover the crockpot. Cook for 6 to 8 hours. 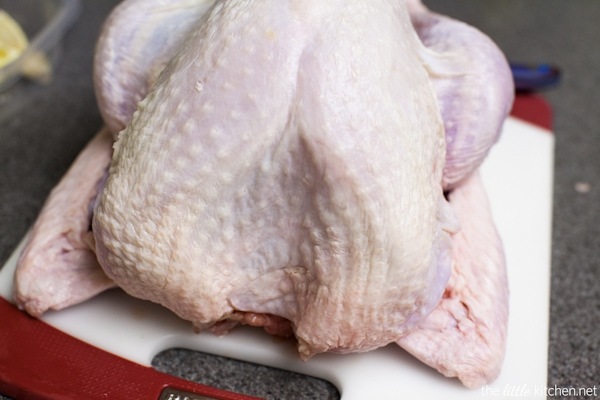 Remove the turkey and place on an oven-safe baking dish. 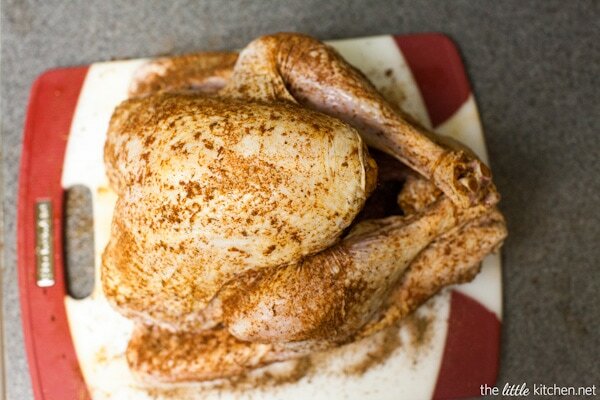 Broil the skin in your oven broiler for 4 to 5 minutes, watching it carefully so it doesn’t burn. Allow the turkey to rest for 30 minutes before carving. Skim the fat from the broth and save it for another recipe! I’m thinking turkey ramen noodle soup are in order for this week! 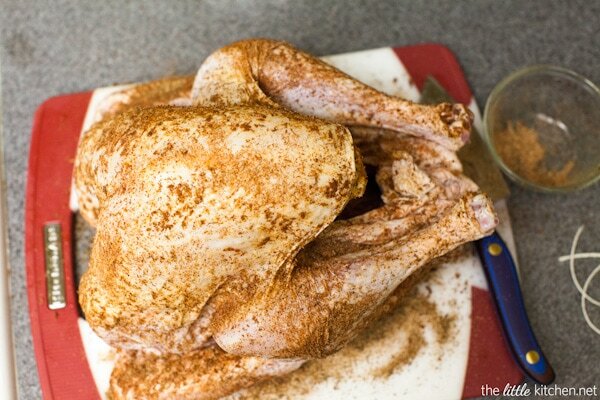 Once you carve the turkey, add some broth to the turkey to keep the meat moist. 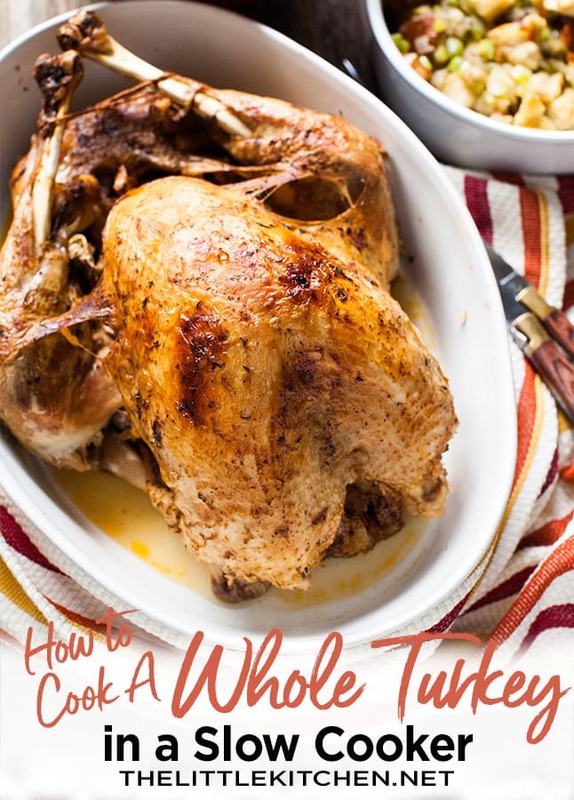 We loved this and it made it less stressful in the kitchen since I was able to do all of my sides in the oven without them having to compete with the turkey. We’ll definitely do this again! Wishing you and yours a happy Thanksgiving and hoping that you have a lot to be thankful for! I know I do! Huge hugs! Combine salt, paprika, onion powder, dried thyme, white pepper, garlic powder and black pepper in a small bowl and set aside. 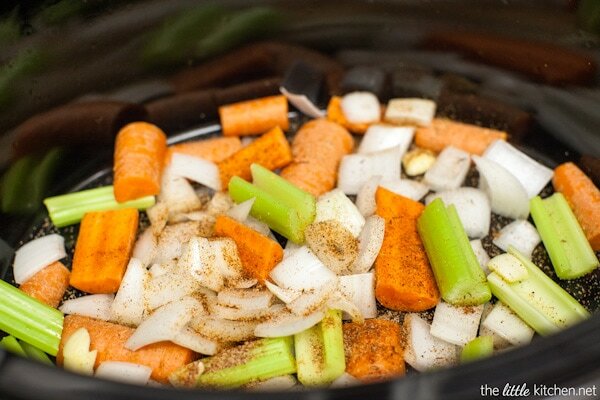 Prep the vegetables and place inside the slow cooker (I use a 7-quart oval one like this one or this one). 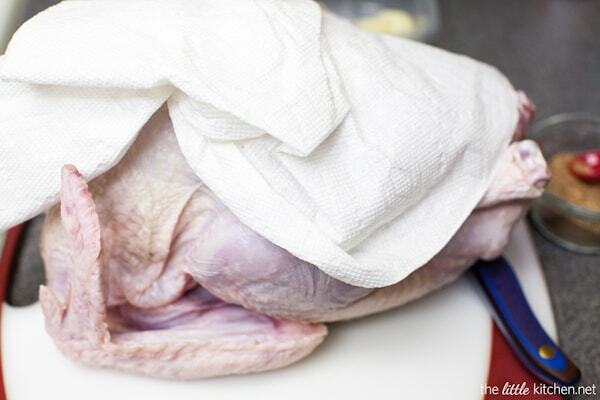 Remove turkey from packaging and remove neck and pouch with organs. Discard or save for use in another recipe. Optionally, rinse turkey with water. Pat dry with paper towels. Fold back the wings. Rub smashed garlic all over outside of the turkey. 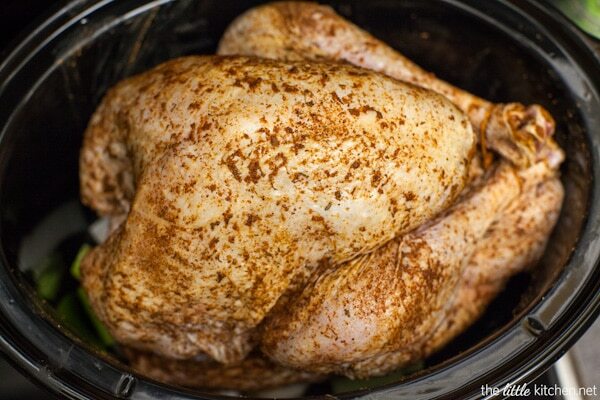 Put one garlic in the slow cooker and the rest inside the turkey. 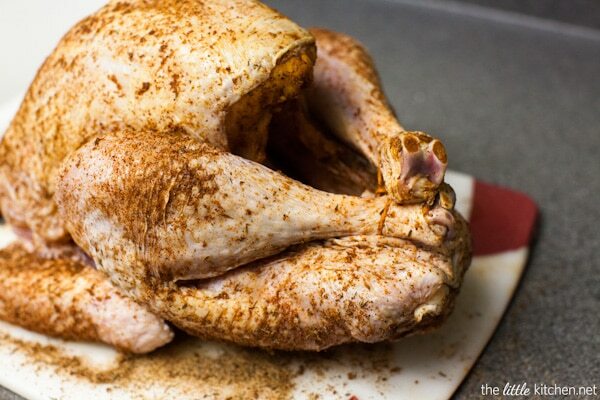 Put the rub all over the outside and inside the turkey. 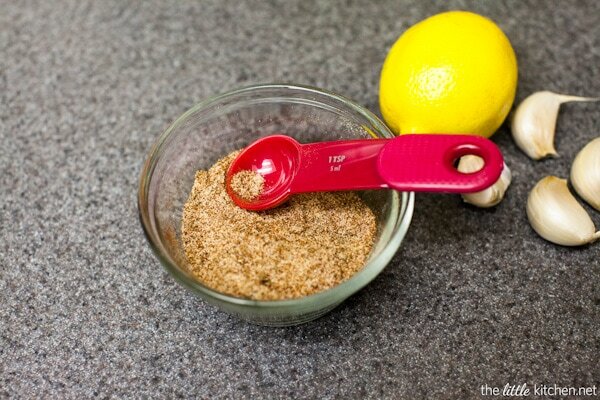 Add the quartered lemon to the inside of the turkey. Tie the legs with kitchen twine. 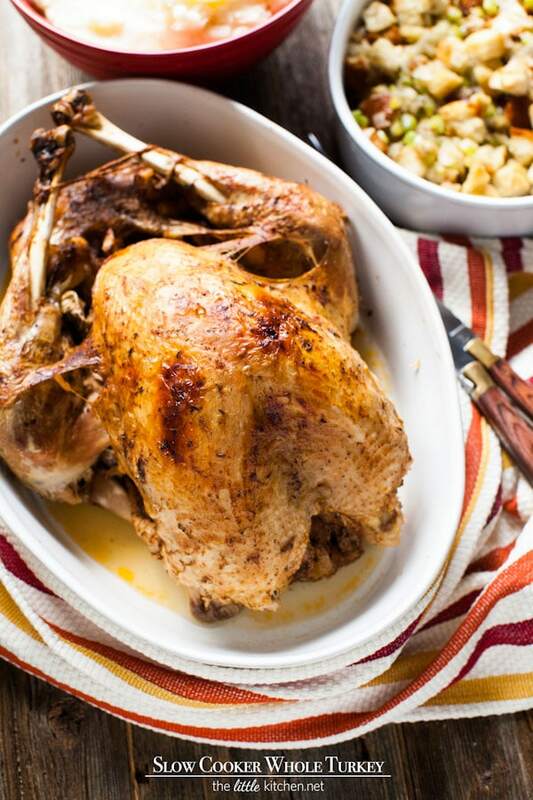 Remove turkey and place in a 9×13 glass or ceramic baking dish. Place baking dish in the oven under the broiler for about 4-5 minutes but watch it carefully. 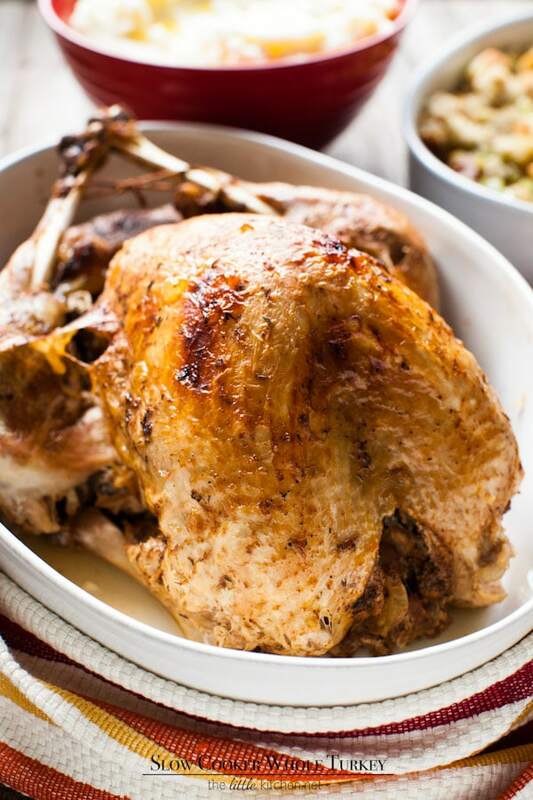 It may take less time or a little longer, depending on the temperature of the broiler in your oven, you don’t want to burn your turkey. 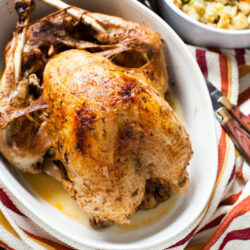 Allow turkey to rest after removing it from the broiler for 25 to 30 minutes. Notes: I know you’re going to ask and no, you don’t need any water in the crockpot! The turkey creates a broth while cooking!